The FAA has finally created new sUAS (aka “drone”) regulations and the result is greater freedom and access for aspiring unmanned aviators. The peril will be more activity in the airspace and undetectable traffic threats for larger aircraft. For this to work we all have to “play nice” in the airspace and follow the rules carefully. To understand who these new regulations affect, we need to define some basic operations. First, a “sUAS” (drone) must weigh less than 55lbs and all these new regulations pertain only to the non-recreational (commercial) use of these aircraft. If you are flying for recreation (not being paid or reimbursed in any way) you can continue to have fun just remember to register your sUAS with the FAA. If you want to get paid for your services, these regulations pertain to your operations. The operating permit is now called a “remote pilot certificate” and there are several ways to obtain (and maintain) this privilege. The new regulations were published here in the Federal Register on June 21st. and they will go into affect 60 days after that publication date. This is why people rushing the doors will not find the tests and applications quite yet. The new Advisory Circular is very well written and covers a lot of the details. Click here for a short headline summary. What is very exciting for eager new pilots are the new piloting privileges. Previously you needed to be a Part 61 certificated pilot (with a medical and current flight review) to legally pilot a commercially operated sUAS. You also needed to obtain a 333 exemption, which was a long and complicated process. The new regulation still allows part 61 certificated pilots to fly sUASs by passing an on-line administered test (on FAA Safety.gov.) but the regs. also open the door for people who have never flown to earn a “remote pilot certificate”. To become an “ab initio sUAS pilot“, you must be at least 16 years of age, complete a knowledge test at an FAA Approved Testing Center and then apply for certification with an FAA Pilot Examiner (similar to applying for a student pilot certificate). There is a new Airman Certification Standard for Unmanned Aircraft Systems that provides guidance for the knowledge test. There is no “fight test” just the application for certificate with the same TSA vetting process that all pilots now undergo to get a certificate. AOPA has published a helpful guide to UAS pilot certification available here. The flight privileges and limitations of the new CFR Part 107 (Federal Regulation) are similar to the rules currently in force. The maximum altitude (without a waiver) is now 400 feet agl. the maximum allowable speed is 87 KIAS. Operations are limited to daylight hours (and civil twilight) and line of sight operations. Flight over non-participating individuals is prohibited, so don’t be sailing around the stadium over the crowd’s heads! Remember, these sUAS can be as heavy as a full box of stationary and usually have many spinning blades like a blender! If an airport is ATC controlled you must have prior approval to operate within 5 miles of the facility but at non-towered airports there are now no proximity restrictions. sUSAs must avoid the flow of piloted planes and also yield the right-of way to other A/C. As with all piloting regulations, these new rules only function through compliance. There are not enough inspectors to actively police these increasingly popular activities and if continuous violations occur (and especially if public safety is endangered) I am sure these privileges will be curtailed or eliminated. Already, the FAA has done at least 23 enforcement actions against drone operators. An absolutely super source for more information is lawyer (and commercial pilot) Jonathan Rupprecht’s Blog. He is very current and comprehensive on these new regulations. SAFE CFI insurance has been updated to provide CFIs $1 million in liability, bodily injury, and property damage if they are properly certificated sUAS pilots for commercial operations. Join SAFE and receive these benefits. We also have an sUAS group forming to share their learning experiences, register here. Partner with AOPA in Promoting Aviation Excellence! Determining Excellence in Aviation Education: Please Take This Annual Poll. 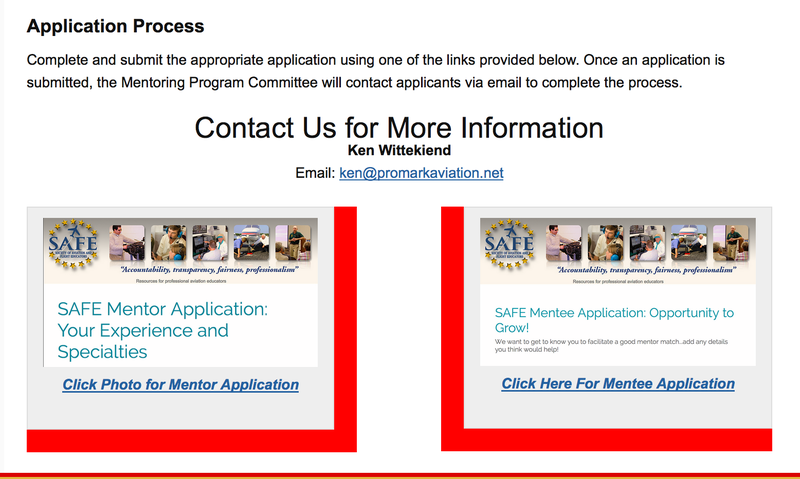 Our primary mission at SAFE is “Promoting Excellence in Aviation Education.” This includes our mentoring and educational programs, developing scholarship programs, promoting STEM education and providing CFI tools like our free “SAFE Toolkit App” to help all flight educators. By raising educators to a more professional level, all of aviation benefits and safety is enhanced. A disproportionate number of SAFE educators continue further to achieve and maintain Master Instructor Certification, far exceeding the FAA required level of currency and professionalism. If you want to turbo-charge your flight operation, read what inspires and motivates flight students and converts them into lively promoters of your brand. The AOPA has also published a series of field guides (available free online), based on this data to help the student, the instructor and the flight schools better optimize their performance and work toward aviation excellence. Please login and take the 2016 Flight Training Poll. This carefully calibrated data allows all of us to do a better job as schools and instructors providing excellence in aviation education. You do not need to be a student pilot to participate. If you have taken any dual recently (and I hope you have) your input would be greatly appreciated and helpful…thanks! Author David St. GeorgePosted on June 20, 2016 Categories UncategorizedLeave a comment on Partner with AOPA in Promoting Aviation Excellence! ACS is here…what does that mean for the CFI, Pilot and Examiner? The new Airman Certification Standard format for the Private and Instrument flight tests hits the ground on June 15th. Let’s all try not to panic and remember to breathe! The very best people in our industry and the FAA gave this new testing standard their best efforts. Remember, the ACS is really only an enhanced version of our out-dated Practical Test Standard and contains the exact same maneuvers and completion standards. It is, unfortunately, written in a challenging tabular format that can be initially confusing. But it *can* be deciphered (with effort) and will soon become a familiar working document for all of us. And all the test prep companies are rushing to comply with this new standard so help is on the way. This ambitious pilot testing overhaul developed out of the SAFE Pilot Training Reform Symposium in 2011. All the industry alphabet players (including the FAA Administrator) were in attendance and you can view the whole 2 day event on-line here. This initiative that progressed into the ACS was developed by a diverse group of FAA and industry players. The original intention was simply to get rid of the “profoundly irrelevant, confusing and out-dated” knowledge test questions. (John King’s words from his article in Flying Magazine on the ACS). Remember the “non-movable card ADF questions” (and similar) on all the pilot knowledge tests? All of these crazy (and never pedagogically validated) questions are now gone! Also gone is the unfortunate game of dispensing the FAA question banks so students could memorize and regurgitate the answers in a rote fashion, multiple-guess format. The new knowledge test incorporates more risk management questions to test the exact same subject matter areas as the flight test. This should make the student training process much easier. A student now should only need to study and learn one body of relevant information and skill to pass both tests. This should be a big win (depending on how well they construct the new questions) for everyone. Along with the “knowledge test purge” the ACS change agents felt it necessary to also reformat the PTS with a face-lift called the “Airman Certification Standard” for flight testing as well. As a pilot examiner I applaud the intention of this group. The old PTS (very similar in fact to the older Flight Test Guide) had become bulky, repetitive and confusing. Every time we needed to add a human factors area it was pasted into the preface as a “special emphasis item” with no indication where exactly how it integrated this into the rest of the evaluation. Additionally, though we DPEs were encouraged to perform the testing in a scenario-based format and assess judgment and risk management, there was no real guidance or justification for this process. The ACS attempts to integrate these important “soft skills” of pilot evaluations with the flying “yank and bank” skills and give them more emphasis and gravitas. Did they succeed? We will find out as we put this process in motion on the 15th of June. I have personally conducted over 2,000 flight evaluations as a 141 Chief Instructor and FAA DPE. Usually it is very clear when an applicant is properly prepared and meets the pilot testing standards. Remember this test is pass fail, not a scored evaluation. Just like I brief every applicant; if something in the flight is “unsatisfactory” in flight, we usually will both know immediately. “Unsatisfactory” is usually not a mystery or a close call issue. The harder, and more important areas of concern for future pilots (based on accident data) are the judgment and risk-management areas of flight. These areas now receive full focus in the new “Know, Consider, Do” ACS format. As John King points out in his Flying Magazine Article, these judgment and attitude “soft skills” are the areas that keep you up at night as an instructor or pilot examiner. I have had applicants that fly a pilot flight test very well (and pass) but sometimes they still scare me in these judgment areas. The new ACS will provide the CFI and DPE tools and granular justification to be more rigorous here. Human factors will always be the “final frontier” for every CFI, pilot examiner and also conscientious pilot(!) if we want to improve our safety record. I know there are “ACS haters” out there, we have already heard from you. Please remember though, the ACS is a courageous effort by the best people in our industry to improve our flight safety record. I think it deserves a fair chance and our full support. Sorry, I know an article on the FAA regs can be *quick death* in a popularity contest but please stay with me, I’ll keep this brief and provide good reasons to pay attention. For professionals in aviation this one simple legal requirement is both infamous (but as I hope to show) essential. CFR 91.103 is the much maligned “all available information” reg we all laugh at initially. No one has “all available information” almost by definition so most people chuckle and immediately move on. But if you read this reg. more carefully, it provides really great guidance. It is the one reg. I insist all my students know from day one for basic safety. Please look at (b) first: every flight requires basic performance data, your take-off and landing distances and the length of the runway. Why? Because this is probably one of the most popular ways to hurt yourself in an aircraft! Complacency develops pretty quickly because it “always works” and aircraft are well designed to take offs by themselves (if everything goes right) As a result this phase of flight is statistically the most toxic! On flight tests if an applicant does not know the length of the runway or take-off data this is a non-starter! As professional CFIs we must embed respect for both gathering essential performance data and maintaining an attitude of “ready for anything” on each and every take off. This has to start with lesson #1 and continue on every future operation. At our flying club the bottom of the dispatch sheet has a “fill in the blank” for all these 91.103 requirements and a PIC sign-off (just like the military). You check and accept the aircraft as inspected and verify current flight conditions as well as personal readiness. A little awareness before committing to the skies goes a long way toward improving safety!